I ran into Brittany at the Guerrilla Truck Show in Fulton Market this evening. 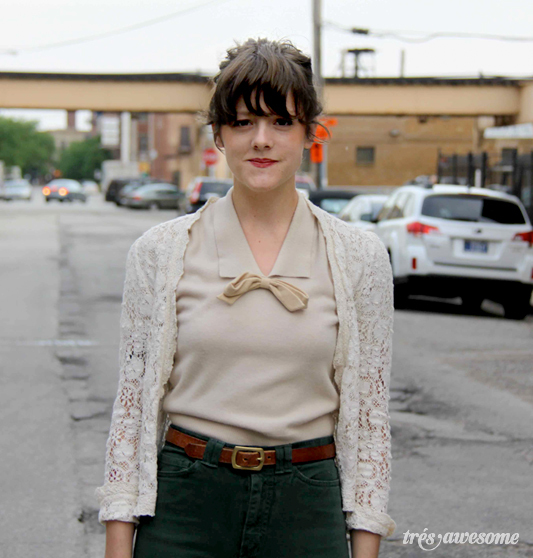 She looks stunning in this lace and sweater set with the high waisted green jeans. Her look reminds me of Kelly Macdonald in Boardwalk empire. Brittany's sweater and lace jacket are vintage, her jeans are from American Apparel and her platform sandals are from Zara. Very nice, like the slim look of the slacks. I really love the lady-like lace and bow. Great 'fit. I went to school with Brittany!